Using upholstery sewing machines is similar to using a regular sewing machine, except an upholstery machine is much stronger and heavier than a regular machine. The large motor and drivetrain allow it to have the power to sew thick materials. An upholstery machine has a large drive belt and a heavy-duty motor that includes a clutch. The clutch allows the motor to engage when the power plate is pushed. Both of these features provide the necessary power needed to push the large needle through heavyweight materials like leather, vinyl and canvas. With the extra power, these machines need larger needles. Upholstery machine needles are available in many thicknesses and lengths. When stitching large stuffed items such as boat and auto seat covers, you may want a long needle even if the outer fabric is lightweight. Uses for upholstery machines also include sewing tents, trailer covers, luggage, furniture cushions, as well as auto and boat seats. You can use industrial sewing machines , like upholstery machines, for sewing upholstery of all types including furniture, auto and boat cushions, seats, camping and recreational vehicle furniture. Industrial sewing machines are equipped with heavy-duty motors and walking pressure feet. This combination allows thick and multiple layered fabrics to feed properly through the machine. Many are available with knee operated power supplies that are attached under a table. These heavy machines need a heavy table or stable platform to sew properly. The movement of the pressure foot, needle-housing shaft and motor will cause the sewing machine to move if it is not secured to a table. A few portable upholstery machines are available. These can sew up to ¼ inch thick materials. This allows for on-site construction of smaller projects such as seat covers, cushions, recreational vehicle interior repairs or replacement. These machines are heavy yet valuable. They’re great for working on upholstery inside an RV or on a boat. Some of these portable models cost less than $1000. Refurbished machines can cost less than $500. Some home sewing machines can be used for small upholstery tasks, but usually need a special pressure foot, needle and tension settings. If you own a sewing machine, please check the owner’s manual before taking on an upholstery project, as sewing thick materials can damage a regular sewing machine. When buying an upholstery machine, consider a refurbished or traded in model. Many times these types of machines are scratched and marked but have years of life left in them. 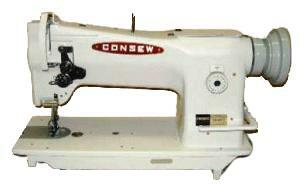 The Singer, Consew, Juki, Merrow and Highlead companies all offer new and used machines. The price difference between a new upholstery sewing machine and a used or refurbished one can be 50% less. Their selection is extensive and service is exceptional. Before investing in any industrial sewing machine try to find a small retail establishment that uses the machine you are considering. Asking a small business owner to try their sewing machine will allow you to test-drive these large heavy-duty machines before you buy. Learning to sew with an upholstery machine is easy and may provide you with business opportunities. Finding a niche that can be filled using this type of sewing machine may lead you to both pleasure and profit. Choose The Best Sewing Machine For You! 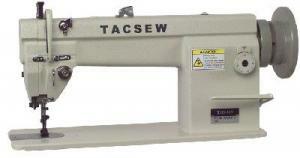 Commercial Sewing Machines - Do You Need These Fast, Durable Machines?